I’m not big on reviewing 7” singles; especially when I’ve never heard of the artist involved; but something about the cover artwork and choice of songs appealed to me, so I dusted off the record player and turned the switch to 45RPM for the first time in years. Gulp! 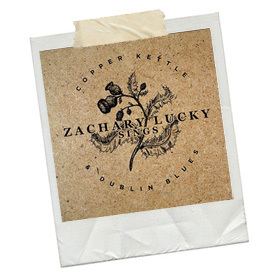 What a voice Zachary Lucky has. Warm, weary and as soft as a well worn leather shoe, it sits comfortably between Townes Van Zandt, Leonard Cohen and Don Williams. While many of you will know these two songs like the back of your hands; most Americana fans under 50 probably don’t; so Lucky’s selection is both brave and sensible. I first discovered Copper Kettle on Dylan’s Self-Portrait (my favourite track!) and the Canadian’s interpretation owes something to that version; but his delivery manages to still find extra poignancy even after all these years. Guy Clark’s Dublin Blues used to be a stalwart of the singer-songwriter/Folk circuit a while back; but I hadn’t heard it for perhaps 10 years, so it felt like meeting an old friend as Lucky purred the lyrics that first time. While it appears Lucky has previously released 3 full albums in his native Canada (he lives in Saskatoon, Saskatchewan) these two sparsely recorded tracks (1 x voice, 2 x guitars and a pedal-steel) mark a new direction; and a favourable one in my opinion. I can’t wait for the album these tracks come from.